Central Idaho Resort Has A “Come As You Are” Vibe. Skiing fresh powder at Brundage Mountain. Credit: Brundage Mountain. 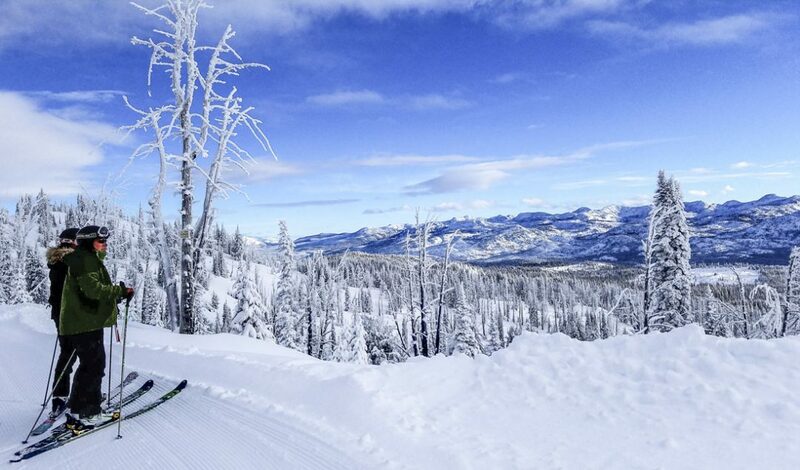 Brundage Mountain in McCall, ID, is one of those places that truly “skis bigger” than it is. “You get to the parking lot and say, ‘How cute,’ but when you go up the chair, you start to see just how much terrain there is,” says Communication Director April Whitney. Okay, 1,500 acres isn’t huge. 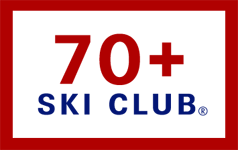 But there’s plenty to ski including some nice, yummy cruising and great upper intermediate trails with a bit of pitch and challenge that are also often groomed. The crowd limiting factor here is the parking lot, and even then, a super busy holiday crowd is maybe 3,000 people though the mountain could hold three times that many. As a result, people grouse about “long lines” if the wait hits 10 minutes. Ski patroller helps put finishing touches on snow train in preparation for Winter Carnival in McCall. Location: In McCall, Idaho, 107 miles north of Boise in west central Idaho. Snowfall: 300 – 350 inches average but it can hit 440 on a good year. Locals claim it’s the best snow in Idaho because it sits where the two main weather cycles, southern and northern, meet. The snow here is a bit colder and drier. In the far west, day old snow becomes concrete as it picks up moisture. “Our powder has the moisture sucked out of it, and it’s actually drier the second day,” said Whitney. Terrain, lifts: 46 named runs – 20 percent beginner, 50 percent intermediate, 30 percent expert across 1500 skiable acres. One high speed quad, four triple chairs. Best cruising is to the far right looking up the mountain. The gnarly stuff is more to the far, far left including another 420 acres of lift accessed back country. Locals who can ski well say the real magic is what’s between the named runs—”wild” powder with unofficial names like Mexico, Switzerland, Naughty Girl. The season typically runs early December to mid April though after that, Brundage is open weekends until the snow is gone. Vertical: Vertical drop of 1,921 feet from a top at 7,803 feet to the base at 5882 feet. Lot to lift access: What you see from the base is what there is. It’s an easy walk to the lodge and lift. There are, however, stairs—four levels worth and no elevator for handicap access. However, if the mountain is called in advance, there is a way to get handicapped people to the lodge upper level and the ski slope. Public transportation: Brundage Mountain Resort has partnered with Mountain Community Transit to provide a free shuttle service to Brundage Mountain Ski Area. The shuttle will start at the Brundage Adventure Center (BAC) with a stop at Lardo’s Restaurant ten minutes after the BAC stop. Transportation to and from the mountain is FREE for everyone. Accommodations: Nothing on mountain. Plenty of lodging in nearby McCall. The vibe: This is definitely a “come as you are” mountain. The important thing is folks here LOVE skiing. And you can find anything in the way of duds, from hunting bibs and camo rain gear to, um, Carhart. It’s not exactly a Sun Valley, Bogner kind of place. 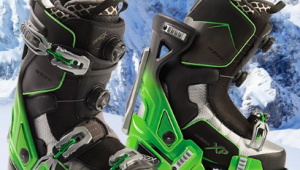 You won’t get a sideways glance at your gear as long as you can link your turns. Preferably well. And there’s a good kids’ center for the grandkids. Dining: An assortment of simple eateries from sit down Smoky’s Bar and Grill to the Main Street Market & Eatery cafeteria to an adults-only bar plus the weekend-only mid-mountain Bear’s Den. 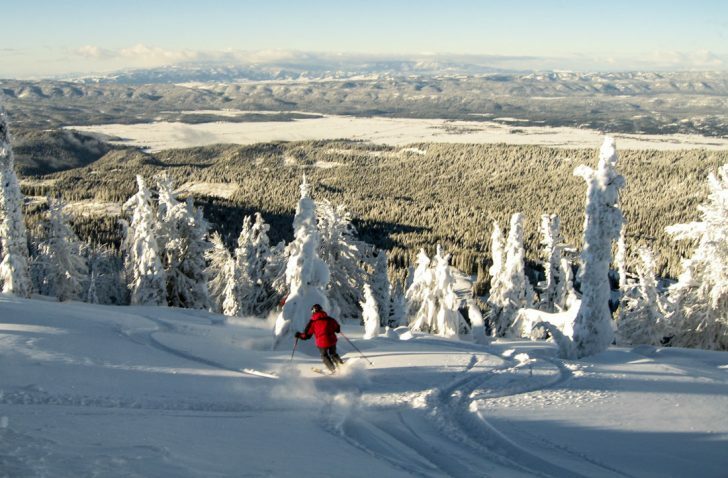 Mountain life: People come to live and play in McCall for its outdoor activities. In winter, it’s snow, snow and more snow. As someone elsewhere once said, “We do not come to look, we come to SKI!” Or snowshoe, or cross country, or snow hike, or fat tire bike or downhill tube or whatever else you can think of outdoors in winter. Your story is timely and spot on. I skied Brundage yesterday. It was windy, probably 20 mph, but a blue bird day. Powder was found between the runs on South facing slopes. I skied in my sunglasses! 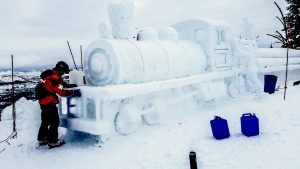 Please, keep “the best snow in Idaho” a secret!